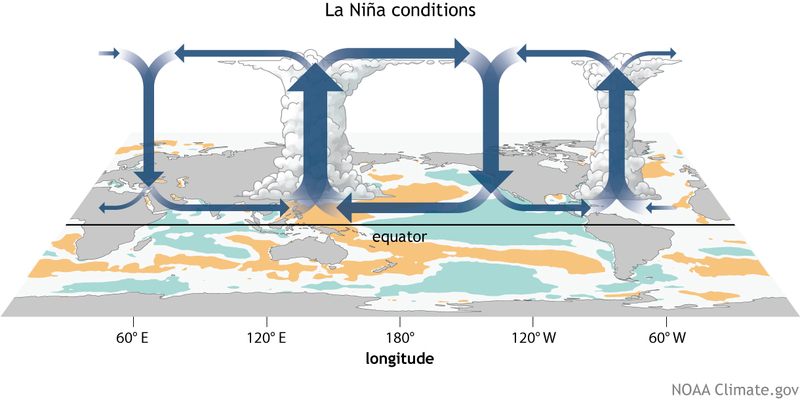 La Niña is typically associated with higher than usual winter and spring rainfall over northern, central and eastern Australia, and cooler than normal daytime temperatures south of the tropics. Warm ocean temperatures to the north of Australia, in the Indian Ocean, and in the Tasman Sea are also currently influencing Australia’s climate. Warm ocean temperatures surrounding Australia provide more moisture to weather systems that pass over the oceans and potentially change the path weather systems take, resulting in more systems reaching the continent. Warm ocean temperatures to the northwest of Australia can be associated with a negative Indian Ocean Dipole (IOD), especially when they occur at the same time as cooler than usual ocean in the tropical western Indian Ocean, near the African coast. Climate models and current observations suggest a negative IOD may be in the early stages of development. However several more weeks of similar ocean temperature patterns would need to be observed before 2016 is considered a negative IOD year. Negative IOD events typically bring higher than usual winter and spring rainfall to southern Australia.